The last decade has seen unprecedented growth and diversity of content from Cartoon Network. While they’ve never been strangers to emotion and heart in their work, even classics like The Powerpuff Girls or Dexter’s Laboratory generally kept their pathos in check with low stakes and low continuity. On the other hand, more recent shows like Adventure Time and Steven Universe frequently push aside punchlines and jokes in favor of deeper, more resonant beats. At times, these shows can hardly be called comedies or action cartoons at all, tending toward more subtle, dramatic work. Cartoon Network’s latest original miniseries, Over the Garden Wall, is the next step in this evolution. Over the Garden Wall follows two brothers, Wirt (Elijah Wood) and Greg (Collin Dean), as they journey through a forest called The Unknown, trying to find their way back home. Along the way, they’re aided by a talking bluebird named Beatrice (Melanie Lynsky) and pursued by a mysterious woodsman (Christopher Lloyd). The Unknown is a magical land, equal parts fairy-tale and early American folklore. 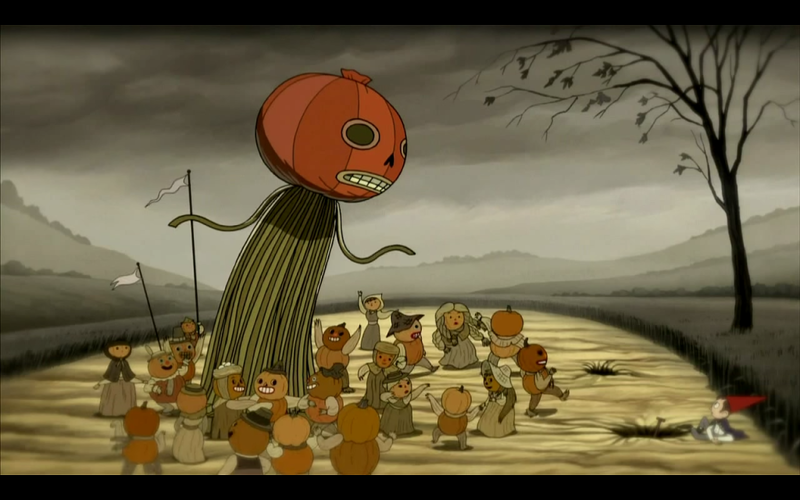 The most striking thing about Over The Garden Wall, which aired in its entirety the first week of November with two episodes per night, is how spooky and atmospheric it’s willing to get. The premiere is essentially a scary story, and although there are episodes that are mostly slapstick, a lot of them deal with melancholy themes like death and loss. While Adventure Time began incorporating these elements more heavily after a couple years, OTGW has them from the very start. This is the story that creator Patrick McHale (an alum of Adventure Time and The Marvelous Misadventures of Flapjack) has chosen to tell and he trusts his audience to go deep from the outset. The show’s premiere is particularly harsh. 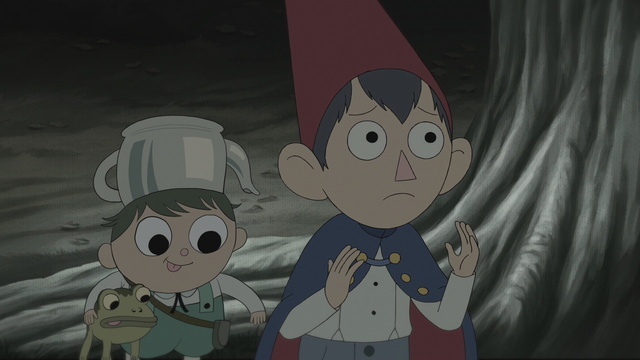 From the moment the audience meets Wirt and Greg, the pair is alone and lost. The supporting cast isn’t built out yet, and most of the episode is the two of them arguing and worrying about what’s in store for them. Greg lightens the mood from time to time (seriously, Collin Dean has some of the best line readings I’ve ever heard), but they’re also menaced by a monstrous dog. Even their victory at the end is a somewhat hollow one; although they escape with their lives, their temporary home is destroyed and they have to venture further into The Unknown. The series is also a treat visually and musically. The Unknown is a malleable setting that allows the show to delve into a number of different genres over its run. One episode, “Schooltown Follies,” is a silly story about animals in school, while another, “Mad Love,” is a Southern Gothic piece about a wealthy businessman seeing a ghost in his mansion. The seventh episode is pretty much a straight-up witch story, reminiscent of the work of Emily Carroll. It’s probably my favorite of the series, creepy and atmospheric but balanced with a couple of really good jokes and some beautiful establishing shots. Backgrounds and incidental characters display the same flair and detail as those on Flapjack, but OTGW is more content to let scenes breathe and unfold slowly, without a reliance on mile-a-minute slapstick. “Lullaby in Frogland,” an episode about Wirt and Greg sneaking onto a riverboat run by frogs, has its share of sight gags, but it applies as much effort into establishing ambiance, like an old painting or a piece of classical music. Very little actually happens on the riverboat itself, but it’s an exceedingly beautiful collection of scenes and pieces of music. While there’s definitely influence from other works–some Miyazaki, lots of Betty Boop, a bit of Little Nemo in Slumberland—Over The Garden Wall is thoroughly its own animal. 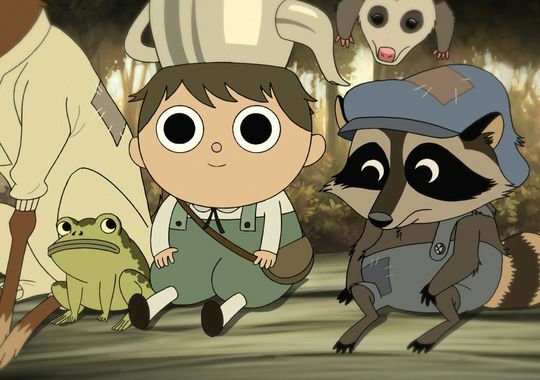 Thanks to its two leads, OTGW is a little more grounded than fairy tale stories. Elijah Wood brings layers and depth to the superficially whiny, sometimes shallow Wirt, and Collin Dean is a delight as Greg, evocative of everyone’s little brother or cousin or what-have-you. The core relationship between family has been explored in Cartoon Network series before, but it feels a bit more honest here, especially towards the end. One of the most impressive aspects of the series, however, is the ending. Don’t worry, I won’t spoil anything, but the fact that it’s a ten-episode miniseries from start to finish is an impressive break from typical corporate form. There are some tie-ins, like a one-shot comic story from BOOM! Studios and hopefully merchandise (sweet, sweet merch), but the producers haven’t stretched the story beyond what they planned to tell. It has a beginning, a middle, and an end. It says what it came to say and then leaves you to think about it. There’s an incredible level of maturity in that, especially in an era where everything is remade and adapted and turned into a trilogy. It’s a smart, deep, and occasionally spooky tale, and hopefully an indicator of the direction Cartoon Network Studios will continue to take in the future. Over The Garden Wall is available for digital download, or on demand via cable and CartoonNetwork.com.